Please contact owner Gino Email: laltamura@aol.com - Phone: 201-273-0723 or 201-319-1756. Mobile Phone: 201-273-0723 Boat Location: Toms River, New Jersey. Boat in Excellent condition, Family Owned, Mercruiser Engine 350/5.7L Mag MPI w/only 180 hours, Bravo III Outdrive with Twin Stainless Steel Props. 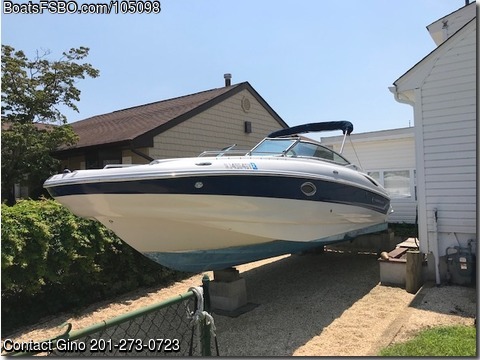 Runs Excellent, perfect Family Boat, comes with Front and Rear Fresh Water Showers, Porta Potti, Coast Guard Package, all life jackets, Bilge Pump, New Unused Anchor, Swim Platform, Trim Tabs, and Dual batteries w/Switch. I just installed new Thermostat, have Spare New Alternator On-Hand for future use, and Comes with New Belts as well. Includes New AM/FM/CD/Bluetooth Stereo in 2016. Boat is being sold for Medical reasons, and has always been Professionally Maintained. Call with any questions, Gino - 201-273-0723.